Hanoi (VNA) – A photo exhibition highlighting the diplomatic relations between Vietnam and Algeria over the past 55 years were showcased in Hanoi on October 30. 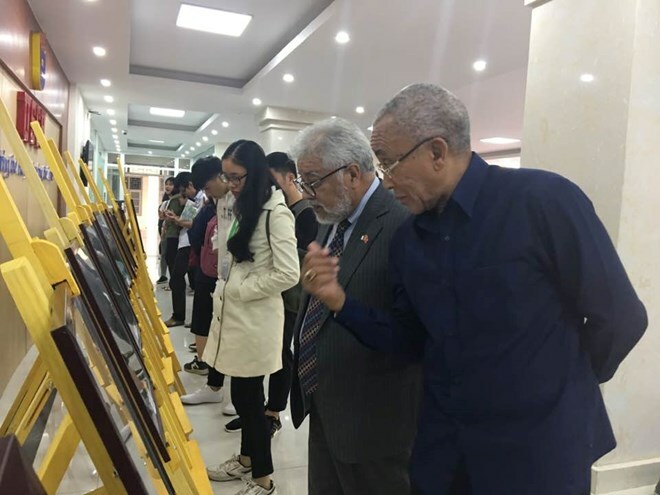 The event was jointly held by the Embassy of Algeria in Vietnam, the Vietnam-Algeria Friendship Association, and the University of Social Sciences and Humanities. Algerian Ambassador to Vietnam Mohamed Berrah said the two countries established diplomatic ties in October 1962. After Algeria gained independence in 1962, Vietnam opened its embassy in Alger capital. Over the past half century, the bilateral relations have been developing across the board, including politics. The two nations share a common vision on international relations built on peace, stability and security while settling disputes via peaceful means without intervening internal affairs and using forces in addition to respecting the national sovereignty and territorial integrity and supporting national self-determination, he added. He noted that the two sides have cooperative relations in various fields. The economic partnership has a lot of prospects, notably the joint oil and gas mining projects in Algeria. The Ambassador said he was impressed by Vietnam’s achievements and efforts in diversifying the economy, attracting foreign investment, and integrating into global trade. Vietnam’s integration will continue to be reinforced given increasing free trade agreements, he added.